THE BIG PICTURE. Genomics is a subset of genetics. Whereas genetics looks at individual genes, genomics views an entire system, including the mapping, sequencing, and functional analysis of the genome—the entire genetic material of an organism. The foundations for genomics were laid in the 1980s with advances in technology that enabled the sequencing of DNA, and the collection and analysis of the mountains of data generated. The field matured in the 1990s, with progress continuing to this day. The name genomics was coined in 1986 by Thomas Roderick, a geneticist at Jackson Laboratory in Bar Harbor, Maine. Mapping and sequencing the complete genome of an organism required advances in analytical tools. In 1953, the DNA structure was determined by James Watson, Francis Crick, and Rosalind Franklin and found to consist of four nucleotide bases: adenine, guanine, cytosine, and thymine. The laborious task of sequencing DNA—determining the precise order of these nucleotides within the DNA molecule—was expedited by more rapid methods introduced by Frederick Sanger and Walter Gilbert in the 1970s (for which they received the 1980 Nobel Prize) and by semi-automated and fully automated DNA sequencing machines, in 1986 and 1987, respectively. In 1995, the genome of the first free-living organism, Haemophilus influenzae, with 1.8 billion base pairs, was published by Craig Venter’s laboratory at the Institute for Genomic Research, followed in 2003 by the mapping the human genome and its 3.3 billion base pairs. A parallel challenge was the storage of this tremendous volume of data in an accessible and readily retrievable format, and the capability to analyze and interpret these data looking for functional correlations. This need has been satisfied by the field of bioinformatics, where information processing systems have been developed to scan DNA sequences and search information libraries for genes that correlate with certain functions, including disease states. 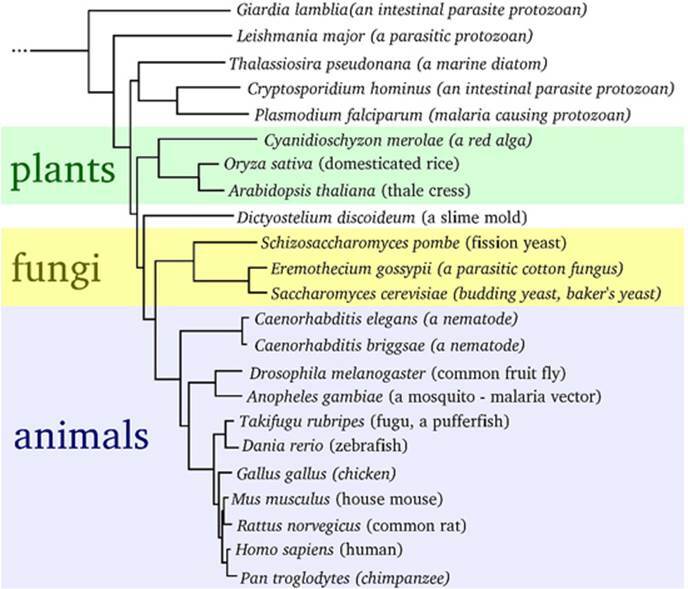 Comparative genomics directly compares the DNA sequences between and among organisms. Fully 99.9 percent of nucleotide bases are exactly the same in all humans, and a high degree of similarity exists between the DNA of humans and insects, supporting the genetic code’s early origin in the history of life. SEE ALSO: The Double Helix (1953), Bioinformatics (1977), Human Genome Project (2003), Human Microbiome Project (2012). This eukaryotic phylogenetic tree, showing the genetic relationship between plants, fungi, and animals, is based on genomic analysis.